In my mind, there’s no better way to kick off a weekend than with a properly hearty brunch. But ever since my local Hawksmoor in Spitalfields stopped dishing up their once glorious big breakfast (weekends haven’t been the same since…), I find myself increasingly having to look outside of the neighbourhood to quell the brunch pangs. 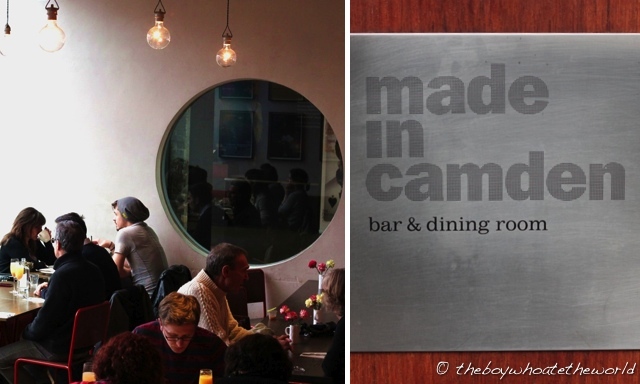 Thanks to a tip-off from fellow blogger and baker maestro breadetbutter, my shortlist of brunch spots worth travelling for now has a new addition – North London’s Made in Camden. The in-house restaurant of the Roundhouse performing arts venue, MiC’s spacious and airy dining room means there’s no long queues or ‘no bookings’ fuss to put up with here that could potentially ruin your weekend. You can call ahead to reserve a table should you wish, but there were still a fair few tables available for walk-ins during our bustling Saturday noon visit. Londoners from all walks of life could be seen tucking into their brunch – the young beside the old… families with prams beside the solo diner unwinding over the weekend paper. It’s laid back, unpretentious and completely accessible to all. Foodwise, the brunch menu is bold, fresh and hearty… featuring everything from pancakes and fry-ups to more exotic breakfasts inspired by the Mid East and Africa. Best of all though is the fantastic value you get here. Not a single dish on the menu costs more than a tenner – a steal given the very decent portions. Their open mackerel sandwich was right up my street – smoky, rich, chargrilled mackerel fillets served on a slice of griddled sourdough and topped with a luscious garlic and saffron infused rouille. But it was their ‘Baked Eggs Shakshuka’ which stole the show for me. Served in a rustic, cast iron pan with a heartwarming tomato ragu, greek yoghurt and grilled chorizo, it’s a dreamy cross between Turkish eggs and huevos rancheros. I only sampled a bite of it, but it’s one dish I’ll most certainly be back for. Service though friendly was a wee bit slow and pedestrian at times. Coffee and food took a fair while to get to us and given the sheer expanse of the dining area, it wasn’t always easy to get the attention of their front of house staff. But food this hearty and this delicious is worth the wait if you ask me. Forget the hurrying and surround yourself with some good company… this is the sort of place you could happily wile away an entire Saturday or Sunday afternoon in. This looks really nice! 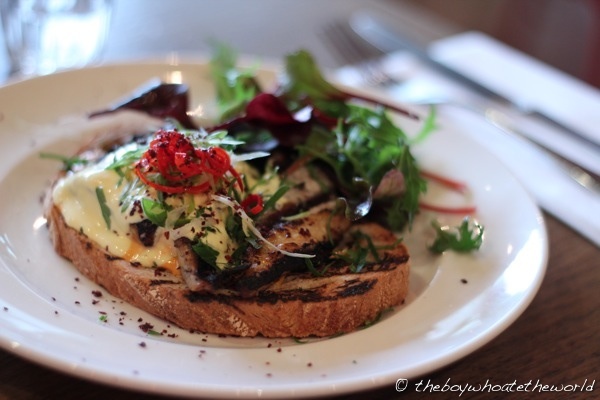 I love places that do breakfasts that are a bit unusual – scrambled eggs I can make at home! I didn’t know that there was a restaurant at the Roundhouse worth going to, next time I’m there for a gig I shall check it out. Ute: I’ve heard dinner is decent so def gonna head back some day and give it a go. Good to hear you and baby are doing well! Am going to try my best and keep the blog going as well (not easy with culinary school, there are some days where I need a break from thinking about food =P). Those baked eggs look divine. It’s so refreshing to find somewhere whose customers are a mixed bag. There is nowhere good for brunch near me, and traveling makes my tummy grumpy! @Milli: Going to try an recreate those baked eggs at home in my cast iron pan one weekend! 🙂 Are there really no good brunch spots your end of town at all? 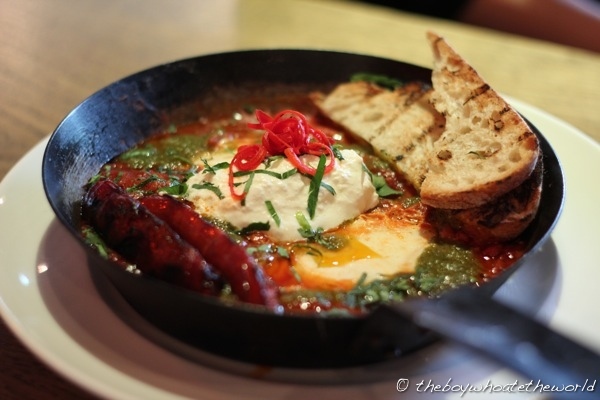 That shakshuka looks amazing – I am a big fan! Try The Breakfast Club in Spitalfields and Soho – massive queues at the weekend but worth every second of waiting for the great coffee, smoothies and breakfast burritos! @Rebecca: I’m based in Spitalfields so have frequented Breakfast club quite a few times =). I like the place – it’s the sorta joint that puts me in a good mood for the rest of the day, and prices are reasonable!